A quick and easy appetizer for keeping hunger at bay is a flavorful dipping oil. 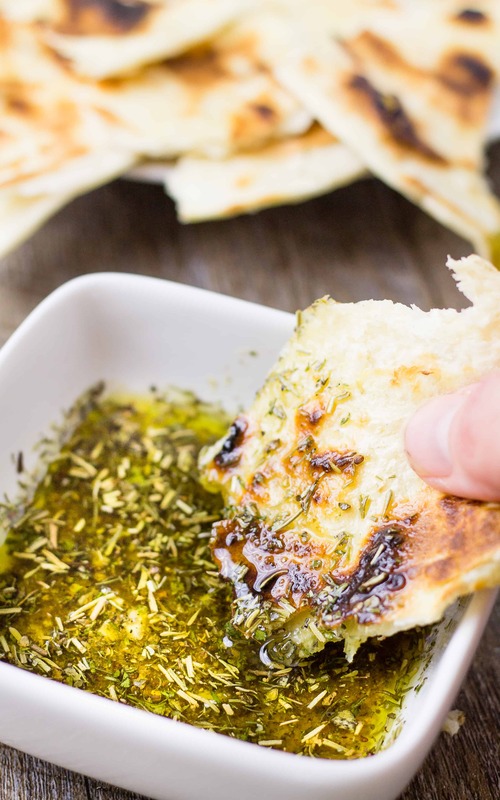 My Greek Dipping Oil is full of aromatic herbs and pairs perfectly with some warm pita bread! Just like the Mexican restaurants put chips and salsa on the table, Italian Restaurants put out this delicious plate of olive oil, herbs, occasionally some balsamic vinegar, and a loaf of warm toasty bread. There is something enticing about fruity olive oil, aromatic herbs, and warm bread that gets my mouth watering. Just like those damn chips and salsa! Carrabba’s is the most notorious for this and there have been plenty of copycat recipes for their bread dipping oil. I order my Shrimp Scampi and salad but somehow I am full by the time the salad arrives because I have eaten my weight in bread and dipping oil. We have been skipping the Italian restaurants lately because Brooks is on a Paleo diet and been eating at a lot of Mediterranean and Greek places. I thought to myself, why can’t I make a Greek Dipping Oil and use some warm pita to soak it up? I know this defeats the purpose of not filling up before the meal but I like to have the dipping oil and bread as a tapas-style meal instead of the whole shebang! Just take me to the Greek Dipping Oil Recipe Already! 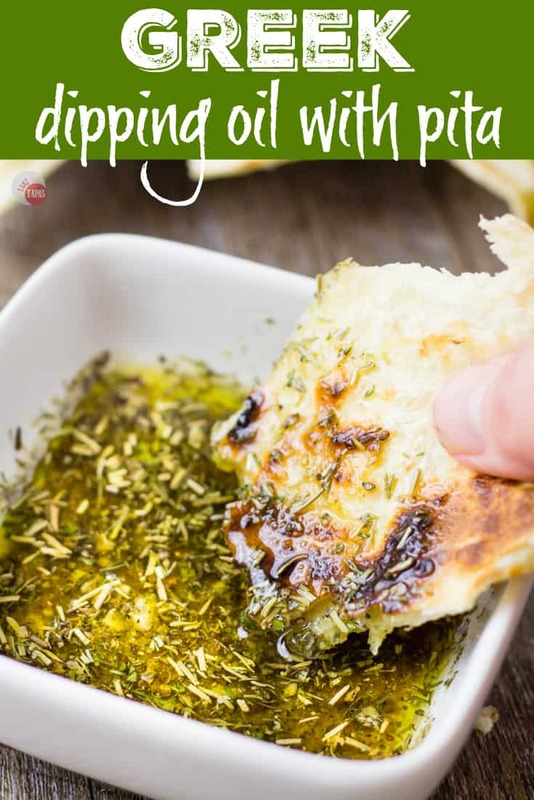 If you’d rather skip my (very helpful, I think) tips and tricks, essential cooking info, and similar recipe ideas – and get straight to this delicious easy Greek Dipping Oil recipe – simply scroll to the bottom of the page where you can find the printable recipe card. What kind of olive oil do you use for dipping oil recipes? Because the herbs and the olive oil are the stars of the show, you need to pick a high-quality one. Also, to understand the process of making olive oil to be able to pick the best one for dipping oil, cooking, dressings, etc. Extra Virgin Olive Oil is best for dipping. This is the lightest, unrefined, and has all the flavors, aromas, and colors of the olives it comes from. Refined Olive Oil is produced by treating unrefined olive oil to remove some of the bitterness but in doing so the process removes all the color, flavor, aroma, and antioxidant properties that make unrefined olive oil so great! Pure Olive Oil is best for cooking. This version is a mix of the Extra Virgin and refined olive oils to create a lighter color and a neutral flavor. Light Olive Oil is not a low-calorie version of Extra Virgin Olive Oil but a refined oil that has a higher smoke point so you can use it for baking, frying, and grilling. So when picking the olive oil for your dipping oil, choose an Extra Virgin Olive Oil to bring out all the yummy olive flavors and benefits! 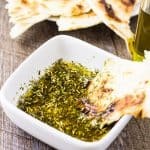 What are some ingredients put in olive oil for dipping bread? Parmesan cheese, finely and freshly grated. Crusty bread, for dipping of course! I love all these suggestions but I am throwing them out the window, going with my taste buds, and making this Greek Dipping Oil with my Homemade Greek Seasoning. All the aromatic and floral aromas of the dill, rosemary, oregano, and marjoram mixed with a hint of cinnamon and nutmeg, make a unique and distinctive dipping oil. 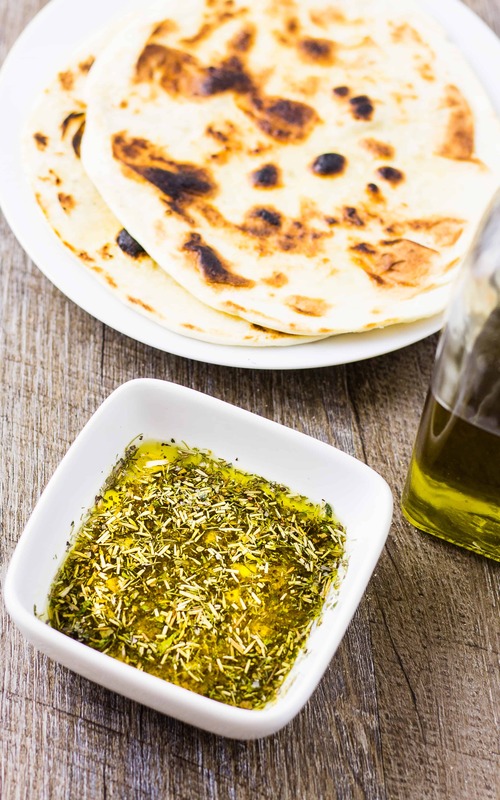 It is best to tackle this Greek Dipping Oil with some warm pita bread. The heat of warm bread only enhances the aromas and flavors and isn’t that what a simple dipping oil is supposed to do? Other great Dipping Oil recipes to try! If you love this Greek Dipping Oil Recipe as much as I do, please write a five-star review in the comment section below (or on Pinterest with the “tried it” button – you can now add pictures into reviews, too! ), and be sure to help me share on facebook! 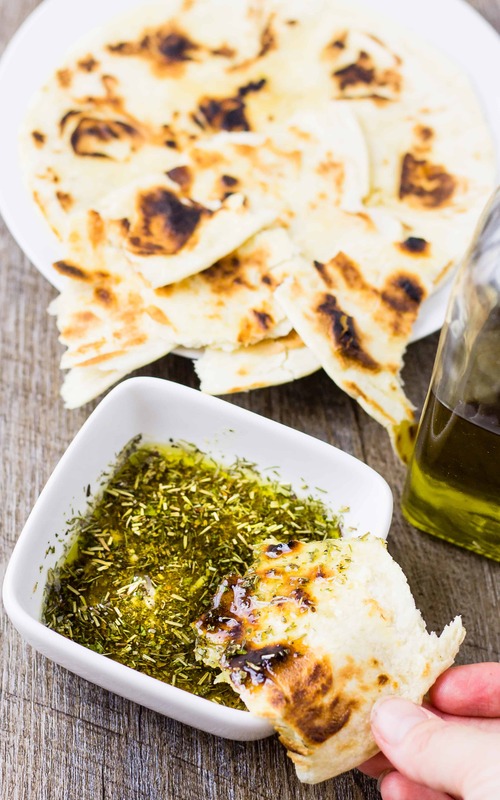 Don’t go to a restaurant and fill up on bread before the meal, make this Greek Dipping Oil and Warm Pita at home for a light and flavorful snack for the afternoon. How about a bottle of wine to go with it? A quick and easy appetizer for keeping hunger at bay is a flavorful dipping oil. 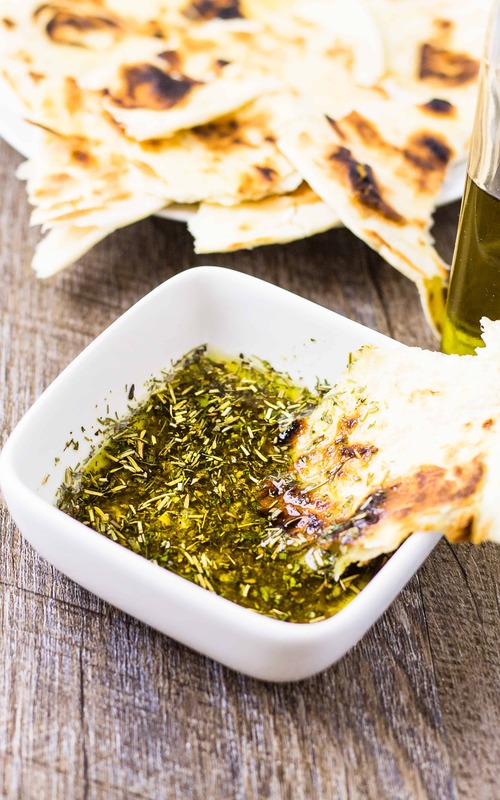 My Greek Dipping Oil is full of aromatic herbs and pairs with warm pita bread! Toast your pita bread for a few minutes to get it warm. Pour your olive oil into a small bowl or plate. Sprinkle in your Greek Seasoning. Oh my gosh! I love the unique taste and smell of the Greek seasoning. What is it, the cinnamon or nutmeg or what? I am not sure. I used it in deviled eggs salad then used it in hamburger for fake but Delicious gyros. Fabulous. I tried every excuse to try it again. This is my go to seasoning this week. I had all the ingredients in my cupboard, so I mixed it up. I look forward to trying more of your recipes. Thanks. Thank you so much!! I really think it’s the marjoram that makes it so unique but the combo of cinnamon and oregano too:) So glad you like it. I love it on deviled eggs too. Especially with some olives.